The rumors about Apple creating a music streaming service turned out be true. Today Apple announced a new streaming service from them called iTunes Radio. At the WWDC keynote today, Apple announced it's new streaming music service iTunes Radio, and it will be integrated with the iOS7's music app. The service will be free with audio and video advertisements, but for $24.99 a year you can use the service ad-free. According to Tim Cook, it's "the best way to discover new music." iRadio will be available for Apple TV, Mac, and of course iOS. 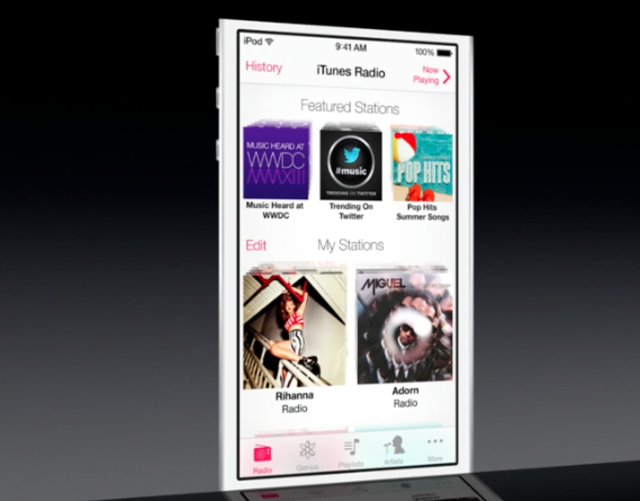 iTunes Radio will also feature Siri integration. There will be over 200 stations, track skipping, and more. Some folks might be wondering why it took so long for Apple to enter the music streaming space, and the reason is because of licensing deals. Last week Apple sealed the deal with Sony, the last major record provider that it needed to introduce a worthy music service. Right now, I'd say that iTunes Radio is supposed to compete against Pandora and Spotify. Apple will have a lot of ground to catch up on if it wants to surpass the excellent algorithms that Pandora uses for recommending similar music and the reputation and ease of use for Spotify's on demand streaming.